Once these halls echoed to the tread of scholars and ceremoniarchs, college functionaries tending to the oghmas and archives of the ancient civilization of the long-lived High Elves. But those days are long gone. 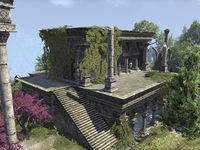 The Cathedral of Webs is a ruin located in the northwest on Summerset.